Egypt could learn from India: Dictatorships could learn from the south’s democracies. Why the authoritarian critique of Western democracy misses the mark. 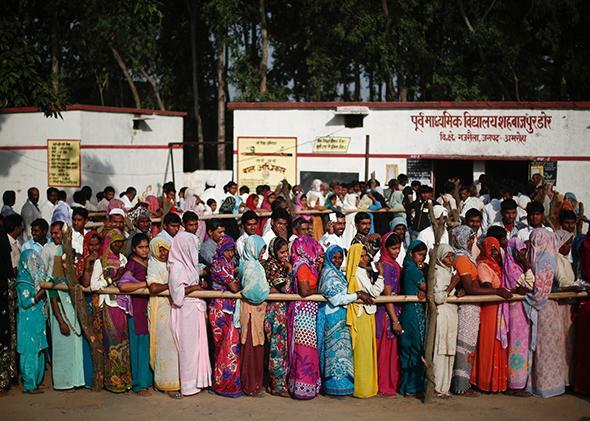 Voters line up at a polling station to cast their votes in the northern Indian state of Uttar Pradesh on April 17, 2014. LONDON—At a highly orchestrated “election rally” in Cairo last weekend, supporters of Abdel Fattah al-Sisi sang, danced, and waited in vain for him to show up. Unsurprised, most assumed that Sisi—the military leader who ousted and jailed Egypt’s previous president—didn’t come for “security” reasons. Since taking power last summer, Sisi has overseen the murder of hundreds of members of the Muslim Brotherhood and the arrest of some 16,000 others. He has declared he will eliminate the organization “just like that.” So he has enemies: Two assassination attempts have been foiled already, and clearly he’s expecting more. This argument is not new, nor is it uniquely Egyptian. All over the world, it is often said that “Western” democracy, as practiced in relatively wealthy, homogenous societies, can’t work in ethnically divided, politically partisan, or profoundly unequal developing countries. One also hears that economic growth in poor countries requires a one-party state or authoritarian rule, since democracies just can’t make good decisions. Never mind that the vast majority of autocracies look more like Egypt than Singapore: Since the financial crisis of 2008, and thanks to the success of China, Sisi’s line of argument has become both more common and more acceptable. Yet this dichotomy—illegitimate dictatorship on the one hand, the example of Sweden on the other—is false. There are democracies that thrive despite ethnic and cultural divides far worse than those in North Africa. If Egyptians are looking for a political system that can manage divided politics while at the same time achieving economic growth, they should look not west but south, toward the developing democracies of Brazil, India, and South Africa. This is the conclusion of a two-year project recently carried out by four think tanks in Johannesburg, Rio de Janeiro, New Delhi, and London (among them the Legatum Institute, where I am a director), which explored the relationship between democracy and economic growth in those three countries. Although not all of the conclusions were straightforward, one was inescapable: In countries with high levels of poverty and inequality, democracy can help balance the demands of wildly divergent ethnic, religious, and political groups, while at the same time creating the basis for fast growth. At the time of independence, no one knew whether democracy was even possible in India, a country with dozens of languages, multiple religions, and high poverty. But more recently, the Indian analyst Pratap Mehta has argued, along with others, that democracy may be “the only mechanism for holding India together.” No other system could have fostered the bargaining, the deal-making, and the local and national coalitions that have kept relative peace on the subcontinent for more than 60 years. India, which has just held the biggest election in history—814 million people were eligible to vote over 36 days—has, contrary to many outsiders’ assumptions, also lifted millions of people out of absolute poverty in recent years. Many of them turned out to vote. No one would pretend that India is a perfect model that should be slavishly copied, by Egypt or anyone else. Neither is Brazil. But it too is a country that, on paper, shouldn’t work: The disparities in wealth are too wide. Yet for the past several decades, power-sharing has worked in Brazil, while inequality has shrunk dramatically. Why then don’t Egyptians study what happened in Brazil instead of dismissing the experiences of France or Sweden as irrelevant? In part, it’s because Sisi’s real interest is in maintaining the power for himself and his friends. But it’s also because democracies, especially developing democracies, are bad at selling themselves. On the surface, they appear weak, riven with conflict and self-criticism. They air their corruption scandals in public. They allow public protests. By contrast, autocracies appear smooth and united—until, suddenly, they aren’t. If they want long-term stability, Egyptians need pluralism, power-sharing, and institutions that can resolve conflict, not suppress it. But they don’t need to look to Europe or North America for examples: The developing world has many such institutions, if only they make the effort to find them.